The following prizes are established: To originality and innovation, to the best composition and design, and a special prize from the public. The presentation ceremony was attended by Diego Rodríguez, Councilman of Celebrations, Miguel Fernandez, Councilor for Enonomic Promotion, José Luis León, member of the Association of Small Commerce, Serafin Delgado, as King of Carnival and representing the Carnival Association of Miguelturra, and José María Crespo, coordinator of the Employment Shuttle. 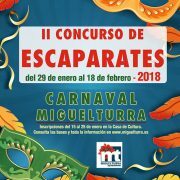 All retail and wholesale retail establishments in Miguelturra and all establishments that have a showcase, such as an office, training centers, among others, may participate in the contest. The registration in the contest will be free and must be made in the Culture House of Miguelturra. The registration period will be from January 15 to 25, the showcase must be ready and displayed between January 29 and February 18. – Award for originality and innovation, you will receive a gift voucher sponsored by Distribuciones Sacra. – Award for the best composition and design, you will receive a travel gift voucher sponsored by Rodrigo Travel and Rodrigo’s Inmobiliaria. – Special prize from the public, you will receive a travel gift voucher sponsored by the City Council of Miguelturra. All of them will also be endowed with 30 publicity spots on Radio Miguelturra, an announcement of 8 by 11 in the BIM (Municipal Information Bulletin) of April, a carnival mask and a diploma of accreditation. 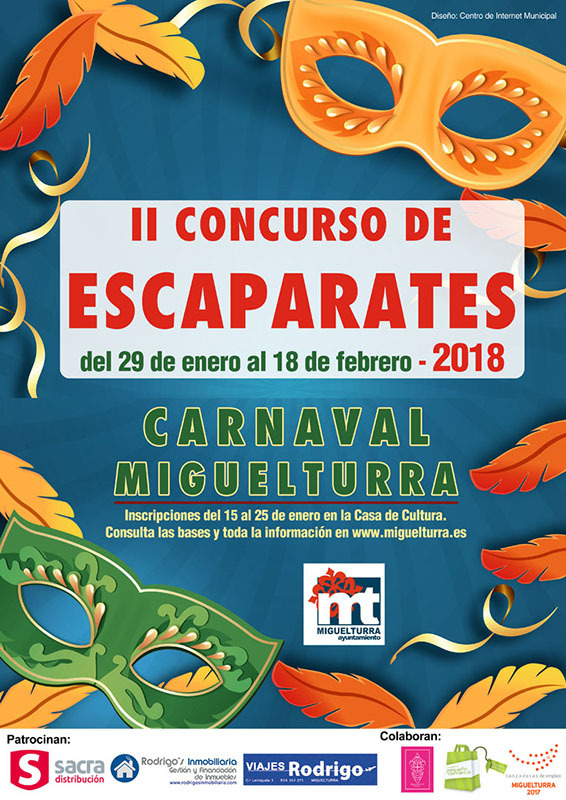 The jury will visit the participating showcases and will announce its verdict during the celebration of the XXXIII Costumes Contest ‘Carnival Museum’ to be held on February 16. The winners will be previously informed so they can attend the awards ceremony. The special prize of the public, will be granted by the vote deposited in an urn located in the House of Culture. From January 29 and until 2:00 pm on February 15, said vote may be deposited, accompanied by a voucher stamped by one of the participating establishments. Of the vouchers deposited in the ballot box, there will be a draw in which three purchase bonds will be awarded, redeemable at any of the participating establishments in the contest and valued at 50 euros each, sponsored by Distribuciones Sacra, Rodrigo Travel, Rodrigo’s Inmobiliaria and the Small Business Association. The owners of the participating establishments in the contest will not be eligible for the draw. The communication of the winners will be made by telephone and will be made public by the municipal media. The prizes are not accumulative.